The Blur Beta is now available for everyone! To originally get access to the Blur Beta, you had to sign up for a code, then wait until you received another in your email, and then you could play. That process is over as the Beta is now in the Game Demos section of Xbox LIVE for anyone to download. The Beta is a lot of fun, and Blur seems like a really promising arcade racing game. Check it out now! 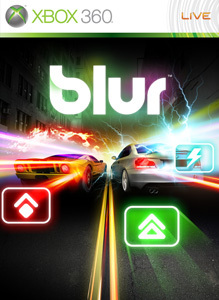 "Blur is non-stop Powered-up Racing: An intense, unpredictable fight to the finish. Travel the globe from L.A. and San Francisco to Spain, the UK and more to take on the best the streets have to offer. Utilize an arsenal of Power-ups like nitro speed boosts, shock attacks, defensive shields, and landmines to beat your rivals across the finish line. Featuring dramatic collisions, realistic damage, stunning racing environments, real world locations, more than 55 licensed photo-realistic cars from the top manufacturers around the world and online multiplayer featuring competitive and cooperative gameplay for up to 20 racers and 4 player split-screen"